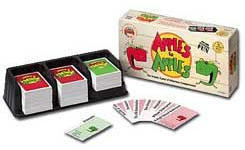 Apples to Apples is a best selling, card and party game that provides instant fun for four to ten players! Size (inches): 10.24" X 2.36" X 4.72"
Apples to Apples is the winner of over eight awards including Mensa, Games Magazine and Family Fun Toy of the Year and most recently honored by The Canadian Toy Testing Council! It's as easy as comparing "apples to apples"... Just open the box, deal the cards, and you're ready to play! Select the card from your hand that you think is best described by a card played by the judge. If the judge picks your card, you win that round. And everyone gets a chance to be the judge! Each round is filled with surprising and outrageous comparisons from a wide variety of people, places, things and events. Fast moving and refreshing, Apples to Apples is perfect for any get-together with family and friends! This game was a DEFINITE hit! Our family and friends truly enjoyed this game over the Christmas holidays. What fun!